The suspect got away in the confusion, and it was not known if she bought one of the Xboxes. Ten people suffered minor injuries from the spray and 10 others sustained cuts and bruises in the ensuing chaos. "Last night at 8:30 the suspect involved in the pepper spray incident at the Porter Ranch Walmart turned herself in," police Sgt. Jose Valle said Saturday. She immediately invoked her right against self-incrimination, however, and refused to discuss the incident further. The attack took place about 10:30 p.m., shortly after the Walmart opened its doors for the traditional Black Friday sales on the day after the Thanksgiving holiday that kick off the Christmas shopping season. 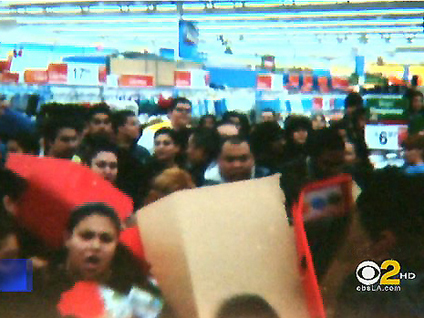 A crowd of people had gathered to wait for store employees to unwrap the crate of discounted Xboxes. The incident was among those nationwide in which violence marred the traditional kickoff to the holiday shopping season on the Friday after Thursday's Thanksgiving holiday. In the most serious case, a robber shot a shopper who refused to give up his purchases outside a San Leandro, California, Walmart store, leaving the victim hospitalized in critical but stable condition. In Sacramento, California, a man was stabbed outside a mall Friday in an apparent gang-related incident as shoppers were hitting the stores.